The deadline for articles, press releases and sponsored White Papers for the next issue of S&T Journal (e-Digest) No.3, Vol.102, March 2009 is 16 March 2009. You can submit your article or press release online. For more information and instructions of preparation click <here>. Training Courses section with up-dated section about course on Effective Online Advertising for High Technological Sensor and Instrumentation Products, 20-21 April 2009, Barcelona, Spain (online registration is opened). Natick, Massachusetts – February 13, 2009 – Global shipments of electronic pressure transmitters and transducers are forecast to increase from $US 5.6 billion in 2008 to $US 7.1 billion in 2013, according to recent research from VDC Research Group, covering process pressure transmitters and non-process pressure transducers and transmitters. 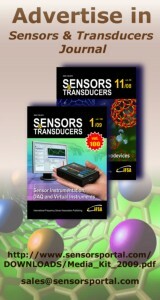 VDC found that medical applications will have the fastest-growing worldwide market for electronic pressure sensors through 2013. A major portion of the medical application market is to suppliers who package these as disposable-invasive blood pressure monitors and catheters. Lyon, February 24th - Yole Développement releases its new report dedicated to MEMS energy harvesting devices. Special attention has been given to the market drivers for adopting MEMS energy harvesting devices in different market segments, factoring the progress of competing technologies and cost constraints. It appears that the numerous opportunities for energy harvesting devices must be analyzed carefully, taking into account all aspects of the final application from power consumption profiles to lifetime and size constraints. Applications screened cover automotive, medical, industrial machine monitoring and process control, home automation and defense. Within an environmentally conscious world, MEMS energy harvesting devices promise in principle a cleaner and almost perpetual solution to powering small systems avoiding the use and waste of polluting batteries. Ever optimistic market projections are predicting billions of dollars in revenue for ubiq-uitous sensor networks in the next five to ten years and derive from these numbers large energy harvesting sales and volumes. And indeed, MEMS energy harvesting devices have been a hot topic in MEMS R&D for some years with spectacular developments driven by DARPA programs within the Hi-MEMS cyborg insects. “The reality is that beyond the technological buzz, commercial applications are slowly starting to get to market for industrial applications and home automation appliances. This is driving the first volumes for energy harvesting applications, but not necessarily at the micro scale”, explained Ridha Hamza, Project Manager at Yole Développement. Hot market segments in 2007 and 2008 such as tire pressure monitoring systems where batteries are currently the dominant solution have driven enormous efforts but the market dynamics have not made it possible to accept a premium price for alternative solutions. Yole has focused his efforts in this report into a fine analysis of the market drivers for using MEMS energy harvesting devices, in comparison to micro batteries, micro fuel cells, or even solar cells. Different application fields from medical to home automation, industrial process control, machine monitoring or automotive have been analyzed in this report. The challenges facing this technology were examined in a broad view, from a technology but also from a whole product point of view. There are needs for better power density but also for less power consuming electronics and wireless communications! Market acceptance of MEMS energy harvesting devices is a function of several parame-ters that are studied in the report. These parameters include, but are not limited to: size, cost, amount of power gener-ated versus amount of power needed by the system and projected lifetime for the energy harvesting device compared to the system parts lifetime. A major factor to be taken into account is whether there is enough power harvested for a particular application from a particular environment, and whether the scavenged power needs to be stored. As piezoelectric MEMS energy harvesting devices can cur-rently power sensor nodes requiring 60 uW according to the latest developments, a companion energy storage device would be necessary for most applications. Commercial success will come from a full understanding of all aspects of the system to be powered and of the data receiver nodes. Challenges include ultra low power electronics and wireless data transmissions rates and standards.